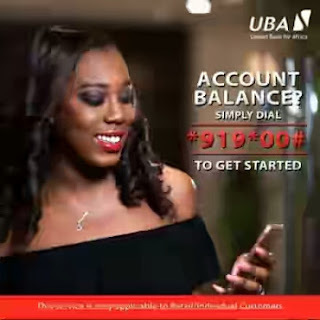 UBA just introduced another simpler way for checking of account Balance associated with any account opened in their bank, and this is through the use of USSD Code dialled directly from a mobile phone. So with the 919 USSD code from UBA, one can enjoy self service from the comfort of their homes, office, and market places. The service was brought out in order to see that customers banking with UBA can enjoy transaction having made simple and so easy. You can believe with me that this is one of the advantages of mobile banking. It requires no internet connection while using it on your phone. The USSD code works on any mobile device as long as the device can allow dialling numbers. Very easy to transact with since it requires not going to ATM for any queuing. Save and reliable for use. Your PIN or password needs to be remembered while using the code. Customers banking with them are liable to use this code in talk to perform below transactions. Use In Checking your BVN number. You can Buy airtme credit directly from your phone. Use in checking of your Bank Account balance in UBA. As the day go by, more service are expected of UBA just as GTBank USSD code functions in a wide range. HOW TO CHECK MY UBA BANK ACCOUNT BALANCE WITH MY OWN MOBILE PHONE? This particular service using ussd code is quit cool and save. Now, it is important to note that first time users of this code are expected to register for a 4 digit PIN which can serve as a means of restricting access from an unauthorized users of your phone. So, when choosing a PIN for the transaction, I would advice you to use a 4 digit PIN that you can easily recur when needed and also make it hard for others not to be able to guess. If you are an old user and would want to change to a stronger pin, then contact UBA customer care for a Pin reset. Now, To check your UBA Bank Account Balance using Short USSD Code directly On Your Mobile Phone, just Dial this *919*00#"
√ For All Banks-How to Recharge Your SIM Directly From Your Bank Account Using Mobile Phone. √ Guide On How To Withdraw From Any Domiciliary Bank Account. √ How To Check Your Account Balance On FCMB Using Your Phone. >> *894*AMOUNT# from First Bank and its for buying airtime only and others. For more and different transactions using your mobile phone, then I would advice you to download the latest UBA U-Mobile Android Application from google playstore. This time around data and internet connection are needed unlike when you are using the USSD code offline for free. That's it, go ahead and enjoy the service from UBA.